I managed to do some sewing whilst visiting Nanny & Grandpa on her old Bernina record. It’s a fabulous machine, so solid and amazingly reliable. The stories it could tell! Well, they would mostly be of me swearing. I raided her cupboards and found some lovely cottons and shirtings but wasn’t able to bring everything I wanted back. Next time, maybe. 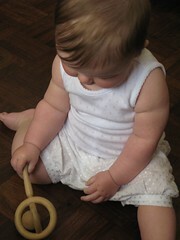 Here’s Coco modelling the bloomers in white cotton pique and shaking my old wooden rattle. It’s quite battered but much loved.